It WAS not quite as big a stroll in Stair Park as the scoreline suggests, but Rangers still won this match comfortably enough. Indeed, the points were secured by the half-hour mark, and had it not been for Stranraer’s defence tightening up considerably, Rangers might have won by six or seven. Yet the original Blues, who were founded two years before the Light Blues, showed real character in the second half after manager Stevie Aitken challenged them to not let the 0-3 scoreline in Rangers’ favour deteriorate still further. “I said to the players not to lose the second half, and they did that,” said Aitken. Stair Park was kissed by sunshine and the Rangers supporters paused to admire the adjacent bandstand and playgrounds in the Park proper – another unusual sight on their Odyssey since the events of early last year. With a crowd of 3,473 compared to an average in the low hundreds, Stranraer became the latest lower-league club to feel the positive Rangers effect on their finances. Perhaps they will use some of the extra cash to fund their supply of match balls which was seriously depleted during the game with numerous hoofs out of the park into the Park, so to speak. Within five minutes Stranraer were feeling the negative effect of Rangers on their goal difference. A curling free kick from the excellent Lee Wallace was met at the far post by Jon Daly, playing as a trialist, whose shot went back across the goal to rebound off the other post. Stranraer scrambled the ball away but at the cost of a throw-in which made its way to Ian Black. The midfielder’s shot took a deflection off Andy Little to deceive goalkeeper David Mitchell and the two players were still arguing about who should get the credit long after the final whistle. Stranraer seemed stunned, but credit to them for buckling down and trying to play attacking football when the temptation must have been to park the bus and save themselves from a leathering. Mark Corcoran in particular caught the eye with several good forays down the left, from one of which he forced the concession of a corner by Nicky Law – the other Rangers trialist of two allowed per league match and again an impressive presence in midfield. Corcoran himself was on hand to collect the defensive clearance but his shot from outside the box was comfortably held by Scott Gallagher. Perhaps they should have parked that metaphorical bus, however, as a rampant Rangers went two goals further ahead before the half-hour mark. The first came after 22 minutes after good work by Lee McCulloch and Little, the latter crossing to Lewis Macleod at the back post who forced the ball over the line. Rangers’ third after 30 minutes killed the match as a contest. From a corner on the Rangers’ right, Law sent a perfect cross to the penalty spot where captain Lee McCulloch was given the freedom of Stranraer to head powerfully home. The Rangers players stayed at the Lodges at Turnberry Hotel – “cheaper than staying in Stranraer” quipped McCoist – and perhaps their minds were on golf at the hotel’s famous Open course because from seeming to bristle with danger, the Light Blues largely switched off. Credit to the hosts, however, for upping their game. Chris Aitken’s free-kick was superbly saved by Gallagher, before Rangers defenders put their bodies in the way of shots from Corcoran and Jamie Longworth. An idiot threw smoke flares to disrupt the start of the second half but we’re not talking the brightest firework in the display, as he clearly did not see Police Scotland’s local finest – high visibility vests and all – right behind him when the third was thrown. Cue a felt collar. Frank McKeown was a hero in defence for Stranraer but should have done better with a header that went straight to Gallagher after two minutes of the second half. Daly had one fine effort saved by Mitchell just before that, and he then set up Dean Shiels with a pinpoint knockdown after 51 minutes, the returnee from injury blasting over. 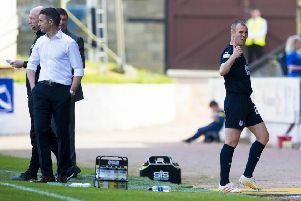 Wallace’s forging runs and Law’s trickery were Rangers’ main weapons, and the latter was consequently felled by McKeown who was booked, as was Aitken for disagreeing with the decision. Aitken saw red shortly afterwards for second yellow-card offence, namely a foul on Macleod. Very embarrassing, as he is the Stranraer manager’s younger brother. “I am disappointed, it was a stupid sending off, but these things happen,” said Aitken senior.